PETROFLO ROLLO 1 LD 15W40 is a Super Premium Duty Engine Oil that incorporates proven friction reducing technology that has demonstrated significantly better fuel economy than the best of two leading SAE Oils, and a leading SAE 15W40 Multi- Grade Oil. It is designed for use in diesel powered and four (4) stroke cycle gasoline powered vehicles, both over the road, and off highway types. Because of its versatility, PETROFLO ROLLO 1 LD 15W40 is an excellent choice for mixed fleets. PETROFLO ROLLO 1 LD provides the good flow properties of SAE 15 Grade, in a cold engine at start up, and the higher temperature properties of a SAE 40 Grade after the engine warms up to operating temperatures. This feature makes it an ideal choice for operation in a wide range of climatic conditions. 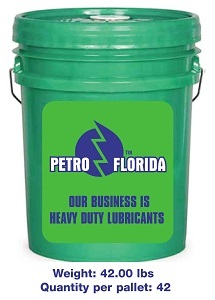 PETROFLO ROLLO 1 LD 15W40, can be used wherever, API, CI-4, CH-4, CG-4, CF-4, CF-2 and MACK TRUCK EON and EOM PLUS OILS, are recommended. In addition, it meets the engine performance requirements of the obsolete series 3 specifications of Caterpillar Tractor and the Ash and Zinc Requirements of Detroit Diesel. It also meets the specifications of Cummins Engine Company. PETROFLO ROLLO 1 LD 15W40, is fully qualified wherever, API, SJ & SH Oils are recommended. PETROFLO ROLLO 1 LD 15W40 meets the engine performance requirements of the current Military Specifications, MIL-L-2104f & CID A-A-52306. PETROFLO ROLLO 1 LD 15W40 is especially formulated to save fuel in diesel trucks and provide excellent performance in al recommended applications. It has the oxidation stability necessary to withstand the high crankcase oil temperatures encountered in over the road and other severe operating conditions. PETROFLO ROLLO 1 LD 15W40 is inhibited to minimize foaming and prevent rusting. It is also fortified with effective anti-wear additives to protect heavily loaded engine parts. In addition, it contains potent detergent-dispersant additives to keep your engine clean, and sludge free. PETROFLO ROLLO 1 LD 15W40 is especially designed to protect turbo charge engines at cold starting temperatures where rapid oil flow and rapid oil pressure build-up are needed.